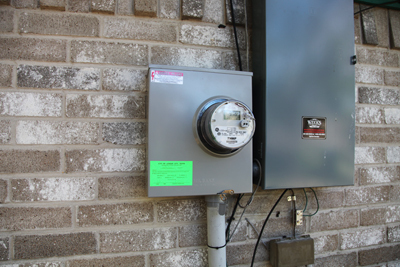 This article provides an explanation of how electricity enters the home via the electric meter (see photo above), is broken down, and is delivered to the electrical switches and outlets via the circuit breaker box and wiring. Most homeowners, including many DIYers, are intimidated by home wiring and electricity in general. This is understandable. Electrical current is difficult to grasp as a concept. It cant be seen but it can certainly be felt. This article will give an overview of home electrical wiring for the homeowner who wants to understand home wiring. Electricity enters the home from the electric company through the bottom of the meter in this case. As it is metered it flows across into the circuit breaker box (see photo above). Older homes may have a fuse box. Sometimes the term load center service box is used. In any event, the power comes in to the main circuit breaker at 220 Volts. Usually, it is 100 Amps. But most appliances run on 110 Volts. What gives? Well, the 220 V can be split. So, in our example, two 110V 20A circuits are the same as one 220V 20A circuit. In reality, in almost all homes, the electrical power is broken down at the circuit breaker box into a combination of 110V and 220V circuit breakers. The primary purpose of the circuit breaker (or fuse) is to break the circuit when too high an amperage demand is put on the circuit. This isnt something the average homeowner needs to worry about until its time for a remodel that involves more space or more electrical demand. Initially, this will be done by an electrical engineer when the house is still on the drawing board. Sizing a breaker panel with a load calculation takes into consideration the square footage of the home and projections for electric heating, cooking appliances, the water heater (conventional or tankless water heater, it makes a difference), the clothes dryer, and air conditioning. 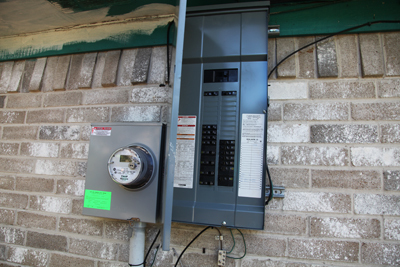 So the power has been delivered to the home and distributed to circuit breakers at the panel or fuse box. What next? The juice has to be delivered to the points where it will do its work and make life good. This, obviously, is done via wiring. Just any wiring? No. Before running any new wiring, check with the local building codes to know what to use. In most cases it will be specified as 12 or 14 gauge nonmetallic sheathed cable, known simply as Romex. Inside this cable are plastic coated copper wires which are color coded. For a few years, aluminum wire was used, but like lead-based paint, it was found to be dangerous and was discontinued. If your home has any, replace it with Romex. Building codes refer to different parts of the home, such as powering up a bathroom, a utility room, or a kitchen. The wire is run though the house inside the framed walls and connected to switch and outlet boxes which are screwed or nailed to the studs. Its standard practice to use black (occasionally blue or red) for the hot wire. This will carry the electrical current. White is the neutral wire and returns the power. Grounding wires of bare copper (occasionally green or green and yellow) gives the current a way to the ground if an electrical failure happens. Electrical Trivia  Thats right, the power goes back and forth. Thus, the term alternating current, or, AC. In the US, electricity is 60 Hertz. One minute has 60 seconds. Digital clocks are amazingly accurate. Coincidence? I dont think so. DO always turn off the breaker before working on anything, such as installing a ceiling fan, replacing a light switch, or installing a home theater. DO test wires with a digital or analog meter, or a Fluke Voltalert. DONT work off a metal ladder. Use wood or fiberglass.